Egg season is upon us! Whether you are celebrating Easter with a bonnet and a basket, or simply enjoying the ongoing nesting of your backyard birds, springtime is synonymous with The Egg. It’s likely that many of you plan to color eggs over the coming week, for display and hunting this weekend. If you’d like to try something a different than the typical grocery store dye kit, we suggest coloring your eggs with natural ingredients. Naturally dyed eggs will take a bit more work than the store bought kits, but the creativity, shade variations and recipes are almost endless. And, if you’d rather limit the ingestion and exposure of less-than-natural substances for you and your family, this is the way to go! For the die-hard OurLocaltopia readers out there, you may recall our egg dyeing video, posted last year around this time. If you’ve never dyed eggs in the natural fashion before, have a look at the video, as it chronicles the process and the resulting eggs. As you can see, the color of each egg depends on what you use to dye it. Your kitchen and backyard are likely full of dye-yielding natural materials: coffee, tea, flowers, beets, berries, onion skins, wine, red cabbage, turmeric. And the list really does go on. We even dyed some of our eggs with backyard weeds; stinging nettle, Bermuda grass and the bright yellow flowers from the sour grass weeds that were invading the yard at the time. The trick, of course, is to use something with a naturally dense amount of pigment. Will it stain your shirt during some over zealous stirring or gardening? Then it will probably dye an egg shell! 2. Add boiling water and a splash of vinegar (about 1/8th cup). Stir to release as much pigment as possible. Allow mixture to cool, and then decant into a wide mouth jar or other container. Whether you strain your dye mixture or leave in the diced or ground material may impact your final egg result. Experiment! 4. Remove eggs from dye mixture, gently. We suggest placing the still-wet eggs back in an egg carton so they can dry without being touched or rubbed much. Once your eggs are dry, you can leave them as they are, which is likely with a very matte finish, or softly rub the eggs with a dab of mineral or olive oil to give them a glossy appearance. Here is a sampling of some of our more unusual results from last year, with a key to what was used for each color below. Rubber band the skins of onions around your eggs, before placing them in the dye, for a wonderful marbled effect. On a clean egg, use a candle or a white crayon to create designs or write names or other words. The dye will not adhere to the waxed part of the egg and the message or design will be revealed when the egg is removed from its bath. For extremely subtle colors, rub your eggs with a cloth or paper towel upon immediate removal from the dye bath. This will dissolve an outer layer of dye, leaving only a muted hint of color on the egg’s surface. Create eggs of many different intensities, using the same color dye bath, by leaving the eggs in the bath for successively more or less time. 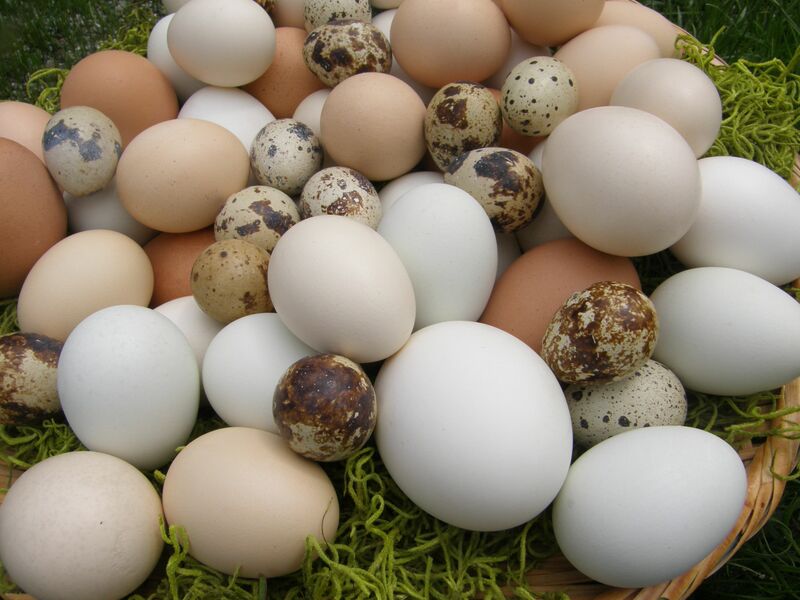 Another interesting, dye-less, but less time consuming natural Easter Basket idea: collect several varieties of brown and white chicken eggs from the store or farmers market, and mix them with quail eggs (available at a number of specialty grocers – Mother’s Market, for one). The result is a beautiful display of the natural variation inherent in eggs. Hard boil your eggs first, whether you plan to eat them later or not. This will save you from messy accidents and keep unrefrigerated eggs stable for a longer period of time. When collecting natural material from your yard to create dye baths, be sure to wash it before processing. This will help remove any dirt or residue that you don’t want on your eggs! Mason jars or cleaned peanut butter or jam jars work as great dye containers. Glass won’t retain the dye stain. Be sure to choose jars with wide mouths, for easy egg entrances and exits! If you plan in advance, a collection of cleaned plastic food tubs (like the containers that house cottage cheese, margarine, Greek yogurt, etc ) can also serve as dye containers, with no worries about staining. As is expected when working with any type of dye, wear gloves and protect clothing and surfaces… especially grout, butcher block or other porous areas! If you plan to hide the eggs for an hunt this Sunday, consider making two batches – one for the hunt and the other for eating. Speaking of eating, as long as the dyed eggs remain refrigerated when not on display, they can still be used for food stuffs! Consider making egg salad or deviled eggs in the days after Easter, so nothing goes to waste! Some of the dye will likely leach into the white of a peeled egg, but this does not impact the edibility and only adds to the color of your eggy recipe. Some of the dyes, though, like coffee, tea and onion, may imprint some flavor on the egg white, so taste test first and decide what is acceptable. Have a look at our gallery from last year’s egg dyeing. This egg was made using beet juice. Notice the variety of textures that result from natural dyeing. Blueberry juice left a varigated blue stain. Keep your egg cartons and use for drying and storing your naturally dyed eggs. They really make an impact when clustered together! Check out OurLocaltopia’s Naturally Dyed Eggs Pinterest page for many more recipes and ideas from around the internet! Enjoy the spring season and get creative! And remember, if you dye any eggs, take a picture and share them with us on our Facebook page, or tag us (@ourlocaltopia) on your Instagram post so we can check out your handiwork! Previous Previous post: Bailey & Alex’s Backyard Wedding!